These boot cuffs have a beautiful lacy design at the top. They are great for anyone who loves a bit of simple lace. Crochet them in any color to match any winter outfit. Finished size measures 15″ in circumference. 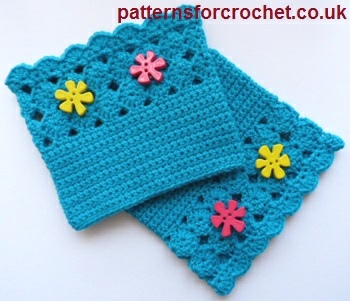 The pattern is crocheted in a #3 worsted weight yarn with a 4.00mm and 5.00mm crochet hooks. You’ll also need 4 buttons for embellishing.